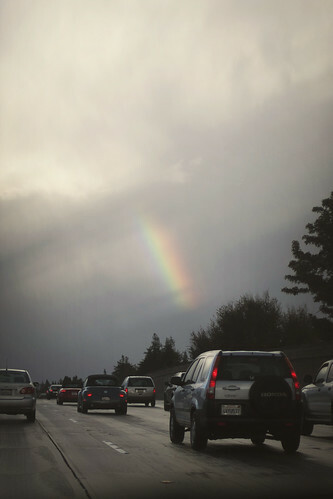 We saw this rainbow on the way to visit with some friends today and help them get rid of some wine (by drinking it all!) The photo is not doing it justice, it was super bright! There was actually a double rainbow (!!! ), but it had faded by the time I got the camera out. So yeah, it's been raining. Which means I wore my raincoat today and I've decided I kind of hate it. The sleeves fit weird and it doesn't really have a lining. So I came home and started looking online for raincoats and the one that I found that I kind of like isn't available until March! It doesn't rain here THAT much, and I did buy a cute umbrella today (my favorite Gama-Go "raining cats and dogs" umbrella broke last night) so that helps, but it'd still be nice to have a decent raincoat. I'm thinking this raincoat from REI might be my next best option, but I kind of wish it was longer. Anyone have any raincoat recommendations? \n\n\nWe saw this rainbow on the way to visit with some friends today and help them get rid of some wine (by drinking it all!) The photo is not doing it justice, it was super bright! There was actually a double rainbow (!!! ), but it had faded by the time I got the camera out. \n\nSo yeah, it's been raining. Which means I wore my raincoat today and I've decided I kind of hate it. The sleeves fit weird and it doesn't really have a lining. So I came home and started looking online for raincoats and the one that I found that I kind of like isn't available until March! It doesn't rain here THAT much, and I did buy a cute umbrella today (my favorite Gama-Go \"raining cats and dogs\" umbrella broke last night) so that helps, but it'd still be nice to have a decent raincoat. I'm thinking this raincoat from REI might be my next best option, but I kind of wish it was longer. Anyone have any raincoat recommendations?